Helloooo Family and everybody else who reads this email. This email will probably be on the short side, but full o' good stuff. The time is going by soooo fast I can hardly believe it!!!! A good thing but also very weird. So on Saturday we watched the Women's Broadcast and then the Saturday morning session live. In English. (thank goodness) it was weird that the Saturday morning session was live, because we were watching it at like, 6pm. haha whaaat? Sunday we watched the Saturday afternoon session, then the Sunday morning session live. We will watch the Sunday afternoon session next week at church. CONFERENCE WAS AWESOME. When Elder Bednar came to talk to us a few weeks ago, he stressed the importance of taking good notes. Not just writing down what people say that sounds good, but writing down what is important for us, which may not even be a quote that the speaker themselves said. We need to be like Nephi, and make our own small plates, full of only the sacred and important things. I really tried to do that this week. I went in with a few questions and let me tell you, I received some answers!! I didn't write down very much, but what I did write down was waaaaay important for me. One of my favorite talks was from James J. Hamula. Totally rad!! Also that song the choir sang, about Jesus earnestly, tenderly calling to us made my life. Can you send me the lyrics? So in between the sessions yesterday, Sister Norton and I opened the door in the kitchen to get some goodies, and there was smoke everywhere!! This dude was making bratwurst on the stove!! He was all like, come in, come in, shut the door! Oh my gosh it was sooo funny. He was cooking up all this wurst, and gave us some. He had like 5 plates full of meat. Dirndls-depends on how nice it is. And if it's on sale right around Oktoberfest. uhhh probably somewhere around 100 euro. Sometimes color relevant, otherwise not. I invited my first person to baptism this week! Auf englisch. 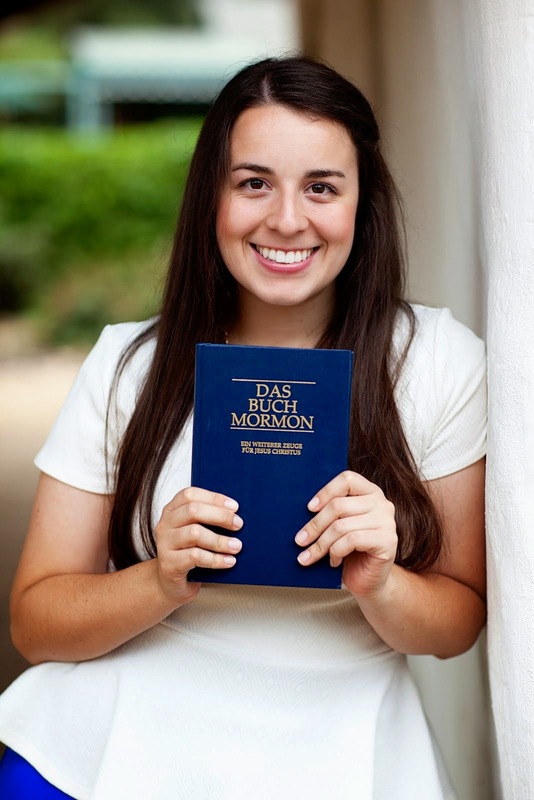 Ruth has been meeting with the missionaries since February now I think, and has been invited a few times before. She really loves God and has such a testimony of Christ and the Atonement. She came to conference, and loooved it. But she is still praying and asked us to pray for her to know if baptism in the LDS church is right for her. I love her! Remember when I said this email would be on the short side...I think you will get a letter from yours truly soon. Something I've realized in the past few weeks is how much we get noticed as missionaries!! The bus, the streets, the store-everywhere! It can be weird to feel people staring at you, but I am so happy and proud to represent the church, and most importantly the Savior. If I didn't have my testimony and knowledge of the Gospel, I think I would feel so lost. Alma 26 is full of verses that I love. God is great. We should wake up each morning full of joy and gratitude. This life is the real deal, don't forget it! I'm really having the time of my life out here, I cannot even say how meaningful and precious this time is for me and for others. Stay gold my friends!! I love you and pray for you often! !